The best conversation piece in my collection is my 1:1 scale Cylon bust display I made from the reimagined series of Battlestar Galactica. It’s popular because of my effort to get it signed by as many cast members from the show as I could. I’m now only missing two autographs that would satisfy my endeavor (Grace Park and Lucy Lawless). For me the value I posses is in sentiment and not really monetary which are the two different types of value one would attempt by having their piece signed. If your goals are monetary value and you plan on selling it I would suggest just the signature without a personalized message on the piece like “To a special fan…” or “Best Wishes ____________”. The sentimental approach, however, means it stays with you always and you’ll probably pass it down to someone special much later on who will appreciate it. Both ways are a great and fun way to enhance your collection. Just getting your desired paraphernalia autographed isn’t enough anymore without getting a letter or proof of authenticity. There is a flooded market for comics and collectibles and a signature can easily be forged, so buyers want the proof. No sweat, every Con I’ve been to had a booth and offered a service for a letter of authenticity for about $20.00. That’s not cheap, though, especially if you add in the cost of the autograph that you had to pay for. I’ve seen the price of an autograph be from $20.00 to $250.00. Personally, for me, I didn’t take the approach of the proof of authenticity. My proof is with the photos I managed to take of the actors signing or posing with me and my prop. Good photos can be printed out and displayed on the shelf with the collection. Leah Cairns will always have a special place with me because she was the first to sign my bust. She was so impressed with it that I offered to make one for her and she has one too now. 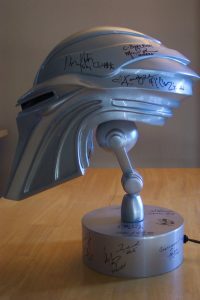 She ended up doing exactly what we’re talking about now, which is getting it signed, when she took her bust on the set with her in the last days of the series and had her cast and crew friends sign it. One last suggestion would be to always have a good black sharpee with you even though the actors always have several on hand with the many head and set shot photos to choose from at their table. Having a sharpee prepares you for a possible lucky encounter at a Con if you bump in to a famous guest in an elevator and they oblige in signing incognito. Don’t forget to get a pick as proof! My pleasure. Congrats on being my first commenter on any of my blog entries. I’ll hook you up with a t-shirt with my logo on it. What size t-shirt do you wear?